Can Water Damage by My Sink be Repaired? Oh, we love a sparkly new kitchen. Coffee smells richer. Fruit tastes fresher. Water boils faster. (Well, it seems to.) Cooking and entertaining guests is just more enjoyable. Until you notice water damage—that soft spot on your kitchen countertop right next to the sink. While the damage isn’t bad enough to justify the time and cost of replacing your countertops, it’s something you definitely want to fix. You probably already know that our countertop refinishing works on all sorts of damage—from chips and scratches to burns and scorches. But did you know that we can fix water damage, too? Miracle Method’s revolutionary process works so well, you’d never even know the damage was there. 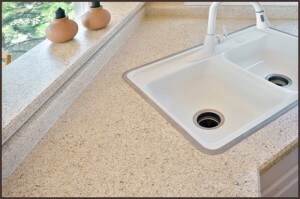 After the repair, our technicians apply a durable new finish to the entire countertop, giving it a smooth surface that has a rich, stone-look to it and feels brand-new. So don’t let water damage spoil your kitchen or your coffee. We can quickly and affordably restore the sparkle—and flavor—to your kitchen. 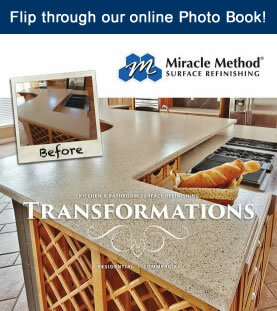 Miracle Method can refinish a wide variety of countertops, like tile, cultured marble, Corian®, Formica®, Wilsonart® and other laminate countertops. Visit our website today to learn more about our countertop repair and refinishing process. If you have questions, go to www.miraclemethod.com/find-a-location.php or call 855-212-7337 to speak with a Miracle Method franchise near you. There was a time when we were enthralled with cultured marble. The drama created by its bright colors. The vivid mock-marble swirling. But now, some of it just looks outdated. Before you replace it, think about the benefits of cultured marble refinishing instead. 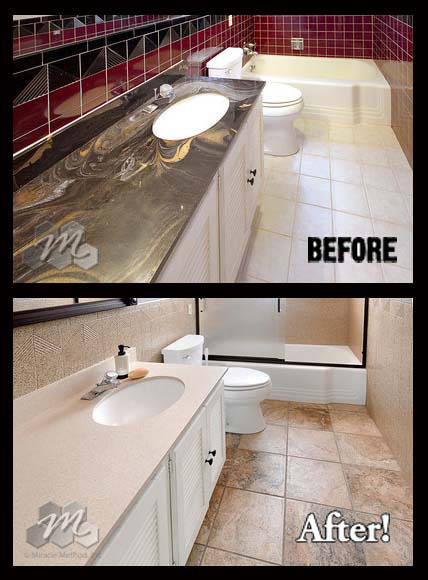 Cultured marble refinishing is fast, easy, and affordable—up to 75% more affordable than replacing your cultured marble. And, your new finish will be backed by our worry-free warranty. 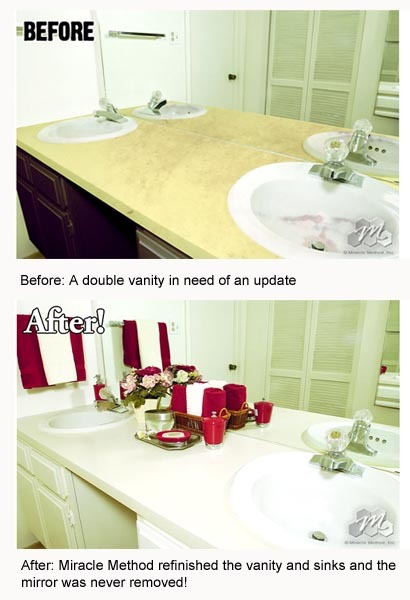 Are you interested in learning more about refinishing your outdated bathroom fixture finishes? If so, contact us at Miracle Method at 855-212-7337. 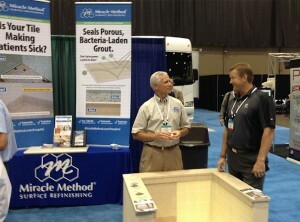 Miracle Method just returned from our third consecutive year of exhibiting at the National American Society of Healthcare Engineering (ASHE) Conference. This year, our booth showcased another important advantage of our process: Permanently sealing tile grout contributes to a hospital’s Infection Control Program by eliminating mold and mildew growth on tile walls and floors. With more than 130 conference attendees visiting our booth, 47 of our offices are busily following up with healthcare facility managers across the country. We’d love to talk with you, too. With franchises across the US and in Canada, we can quickly provide services regardless of size or location. Healthcare facility managers looking for more information about Miracle Method Surface Refinishing should call 888-741-3511.